A few days ago, I read the news that sent me reeling. The day I was hoping wouldn’t come had. Oh, I had some premonitions. I had scried the omens and they were not good, especially with the announcement of a resurrection. But now it has been made official. The Star Wars Expanded Universe will be rebooted. Okay, so maybe that doesn’t seem like a big deal. But it is to me. I love the Star Wars EU. 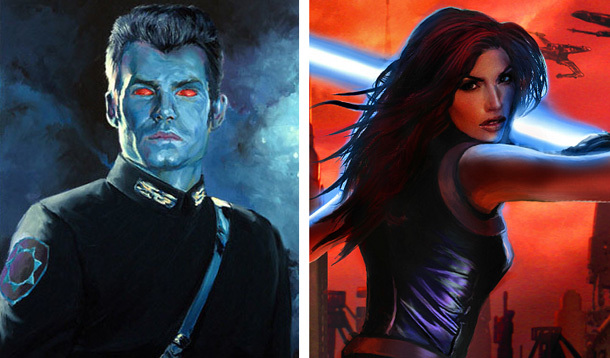 Timothy Zahn’s Thrawn trilogy brought me into the fold and I loved it. My affection for Star Wars, while long-running, had cooled somewhat until that book came out in 1991. But the moment I read about Grand Admiral Thrawn, a genius tactician who plotted out intricate strategies based on a culture’s art, well, I was hooked. This led me to Michael Stackpole’s excellent Rogue Squadron series and Aaron Allston’s hilarious Wraith Squadron books. I loved Kathy Tyers’s work as well as Kevin J. Anderson’s. And the video games! Kyle Katarn became one of my favorite Jedi hands down (although he’s still second to Corran Horn). And the plot to Knights of the Old Republic? I still count that as one of the best Star Wars stories hands down! And the crazy whipturns of the New Jedi Order series left me numb right up until its spectacular conclusion! Can you tell how much I loved it? And I’ll admit, when I heard about Disney creating Episode VII, my immediate thought was, “But what about the EU?” Would they bring in some of the characters or plotlines? Would we get to see a Yuuzahn Vong or two? Or maybe a live-action version of Mara Jade? It didn’t seem likely, but it was possible. But then I heard that Peter Mayhew would once again don the fur and portray Chewbacca, and I knew my hopes were becoming less and less likely (if you don’t know why, I’m not going to explain it, even if it is a decades-old spoiler). And then the official announcement came down. The EU wasn’t just out, it was being razed. Rebooted. Game over. 1. It not my universe. Yes, I loved the stories, the characters, the settings, all of it. But it’s not mine. I may have enjoyed visiting it, but I couldn’t claim any control over it. If LucasFilm wants to reboot it, I really don’t have any say in whether or not that happens. Why get all twisted up over a decision I can’t control? 2. The EU needed a good swift kick in the reboot. Let’s face it, the EU in its present form has been around for over twenty years. During that time, there have been hundreds of stories crammed into it. Some have been excellent. Some have been so-so. And some were awful. With all of those plots and characters and so on, things started to get a little bloated. There was no way I could keep up with everything. In the early days, that didn’t matter. If you missed something, no big deal. But in recent years, the weight of all those characters really started to cause the EU to buckle. That’s something that I realized when I tried to get into the Legacy of the Force series but couldn’t. I retreated into the prequel era books and comics, and especially found myself drawn to the Old Republic time period as well. But let’s face it. There’s a lot of stuff out there. Maybe too much. Besides, this means that it’s a clean slate. We can all start fresh. We can be surprised with new stories, new characters, new ideas. And that’s never a bad thing. Kind of. More specifically, the EU has been retconned on more than a few occasions. For example, the Black Fleet Crisis trilogy implied that Amidala (unnamed at the time) might still be alive. Whoops. Although technically, I still think she should be, but that’s another story for another time. More telling is the question regarding whether or not Jedi could be married. In the early days of the EU, a lot of Jedi were portrayed as being married. Kyle Katarn came from a loving family. So did Corran Horn. Nomi Sunrider, a legendary Jedi from the Old Republic era, was married to a Jedi first, became one herself, and then gave birth to another. And really, why wouldn’t we think that Jedi could get married? In the original trilogy, we only meet five Force adept people, and one of them is the father of another, right? It only makes sense that Darth Vader was married at one point. But then the prequels came out and we learned that the Jedi were supposed to avoid that kind of entanglement. Whoops. So what was the EU to do? Well, there had to be a lot of retconning to explain it all. The EU has never been canonical. The movies have always trumped them. So we shouldn’t be surprised if the ultimate trump card has been played. 4. We haven’t really lost anything. That may seem odd. The EU has been razed and rebooted. All of those characters, all of those stories, all of it, gone! Except they aren’t. Not really. I mean, right now, I still have my Rogue and Wraith Squadron books on my shelf. Via Steam, I can still play Kyle Katarn’s adventures. Disney isn’t going to kick down my door and take that stuff away. I can go back and experience those brilliant stories and moments any time I want. Join the Song of Creation!